The 17th century was the 'Dutch Golden Age'. An era in which the Dutch roamed and conquered the seas, traded with newly discovered worlds and became the wealthiest country on this globe. The men on the ships had to deal with warfare, pirates, storms, diseases and the uncertainty of not knowing whether they would ever return alive. If they did, they would not only bring home precious goods, but also the most astonishing tales. 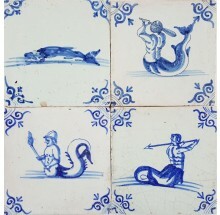 They had seen (and probably fought) monsters, mermaids and all kinds of mythological figures on their journeys. 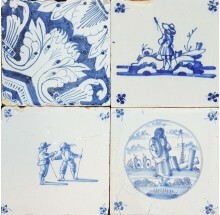 These antique Dutch wall tiles are an original 17th century showcase of what they described and easily feed anyone's imagination. 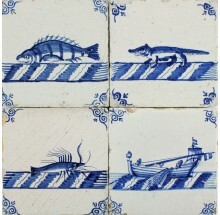 Make sure to check out our collectibles with sea creatures as well. 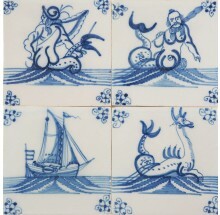 If you have any questions about these Delft wall tiles with Sea Creatures, please do not hesitate to contact us. Click here to visit our contact page.